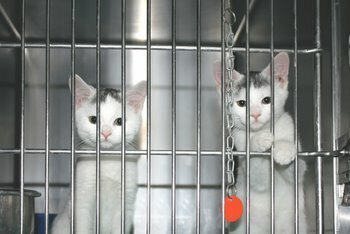 When I worked at my local humane society, I witnessed as many different styles of adopting a cat as I saw different personalities and types of cats. Some adopters left it up to fate. They would come in, look around for ten minutes, lock eyes with a certain kitty, and take it home. Others treated it more like buying a car. They would visit multiple cat rescue shelters, ask lots of questions about pet health and needs, and take a handful of cats out of their cages for a play or cuddle test drive. The selection would only be made after inquiring about the return or exchange policy and cat insurance. Some ran a cat adoption like a beauty contest, picking the cutest cat they saw no matter what they were told about the cat. Keep your home in mind when adopting your next shelter cat. If you have very small children, an older, gentler cat who has experience with families might be a better match than a kitten. If you prefer solitude and quiet nights, there may be a shy cat hiding in the back of her cage, just waiting to be rescued by a kind soul. If your home sees a lot of visitors, a spunky tomcat might enjoy meeting all your friends. Describe your home life to the shelter workers or volunteers and let them share with you the knowledge they have of the cats they work with every day. As much as they would love all the cats to find homes, it’s more important that each cat find the right home, so they don’t end up back where they started. After selecting the perfect cat for you, it will be a good time to look into finding the best pet insurance for your cat. Cat insurance can be complex– so be sure to ask as many questions as you can about pet insurance plans and how they work. By doing this, you’re ensuring your kitty will be a healthy, happy new member of the family.